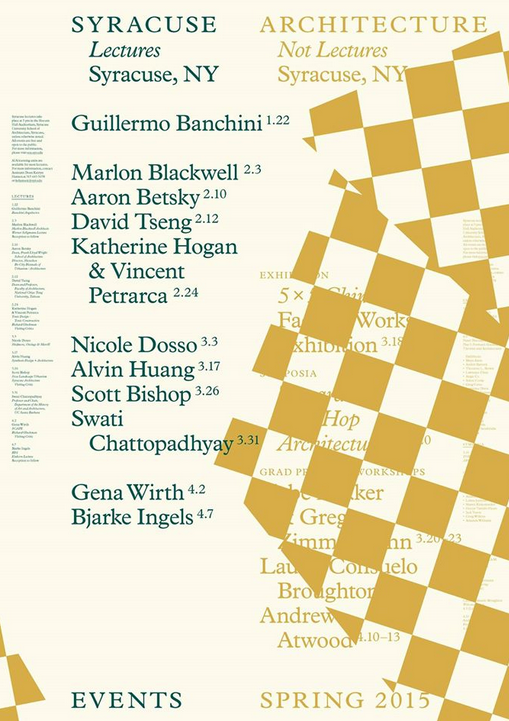 February 23, 2015 (Raleigh, NC) –tonic design | tonic construction, a design-build firm, is pleased to announce that principles Katherine Hogan, AIA and Vincent Petrarca, will give a lecture at Syracuse University School of Architecture as part of the Spring ’15 Architecture Lecture Series on Tuesday, February 24th at 5:00 p.m. and is open to the public. With the flexibility to take on the role of designer or general contractor or both, Tonic’s knowledge of construction and design is a valuable editing device for the work they produce, and it increases the scope of their influence on the final product. As a methodology, Tonic embraces the influence of construction on design (construction-led design) and design on construction as the fundamental premise that defines our work. Other speakers for this lecture series include Marlon Blackwell, Aaron Betsky, Gena Wirth, and Bjarke Ingels. This semester Hogan and Petrarca have been selecated as Richard Gluckman Endowed Visiting Critics at the school. Together they are teaching a studio on dwelling with sites based in Raleigh, NC, the home of their practice and a small but rapidly developing city. Hogan says, “It is truly an honor to be back on campus, teaching and lecturing at the School of Architecture. We have a very talented group of students who are producing exceptional work.” Hogan is a ’05 graduate of the school. As two separate, but constantly interacting companies, Tonic Design and Tonic Construction work toward and execute sensitive modern design solutions that make a difference in the lives of our clients and contribute to the rich, existing architectural fabric of the community.